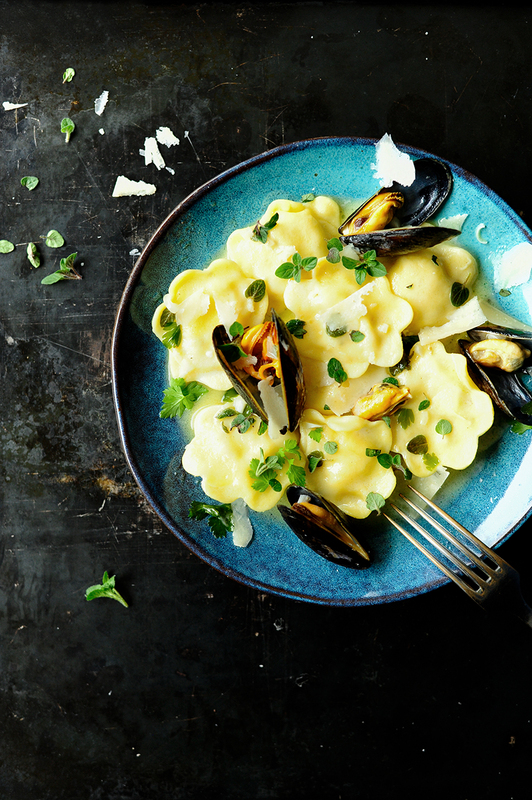 Lots of fish, shrimps and cheese wrapped up in a delicious homemade pasta bundle and an awesome garlicky butter sauce with mussels. The sauce is easy to make, adds so much flavor and is the key to the recipe, it’s made with a stock from the shrimp shells, herbs and it’s thicken with butter. I love making ravioli and I know that it can seem like a lot of work, but trust me, you can do this and people will be impressed with this meal. There’s nothing better than homemade ravioli and it’s worth the extra effort. 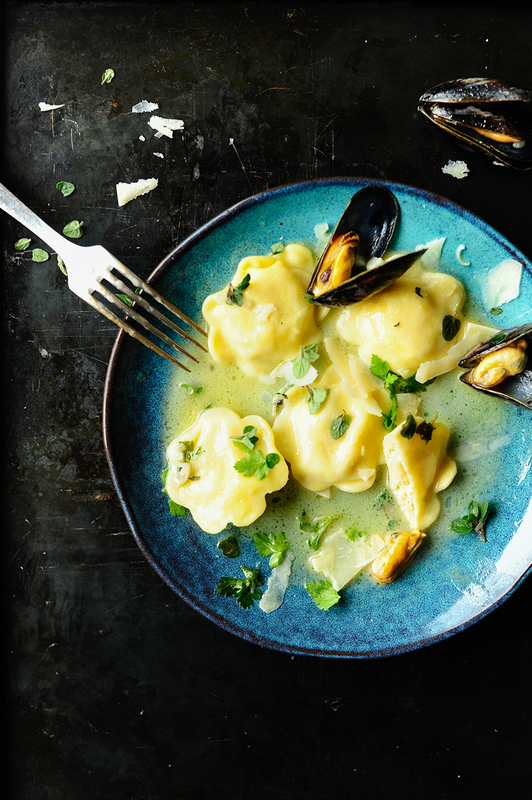 I’m really excited about this recipe, it’s the ultimate seafood ravioli. Place the frozen shrimps in a bowl, pour warm water and defrost, then peel and devein. In a saucepan, heat 1 tablespoon olive oil, sauté the shallot with the garlic clove. Add the shrimp shells and simmer for 3 minutes. Pour 500 ml hot water, add carrot and bay leave, season with salt and pepper and cook over medium heat for 15 minutes. Strain the stock. In a skillet, heat 2 tablespoons olive oil, sauté shallot and garlic. Add fish fillet and shrimps, simmer for 5 minutes. Transfer to a food processor, add potatoes, eggs, parmesan, lemon juice and marjoram and season with salt and pepper. Blend until just mixed. Divide the dough into 4 pieces. Take one of the pieces and flatten it out, brushing some flour on both sides. Roll out into a thin sheet or feed it through the pasta roller. Repeat with the remaining dough. Place scoops of fish filling onto a pasta dough sheet. Brush the dough with water around the scoops of filling. Place a second sheet on top, making sure that there is no air in the pockets. Use a round cutter or a glass to cut the ravioli out. Stick the edges together. Cook in salted water for about 3-5 minutes. Remove from the water with a slotted spoon. In a large saucepan, heat 2 tablespoons olive oil, sauté shallot and garlic. Pour white wine and cook for 3 minutes, add the broth and bring to a boil. Add the mussels and cook for 3 minutes. Add butter, lemon zest, marjoram, parsley and cream. Season with salt and pepper and cook for another 3 minutes. 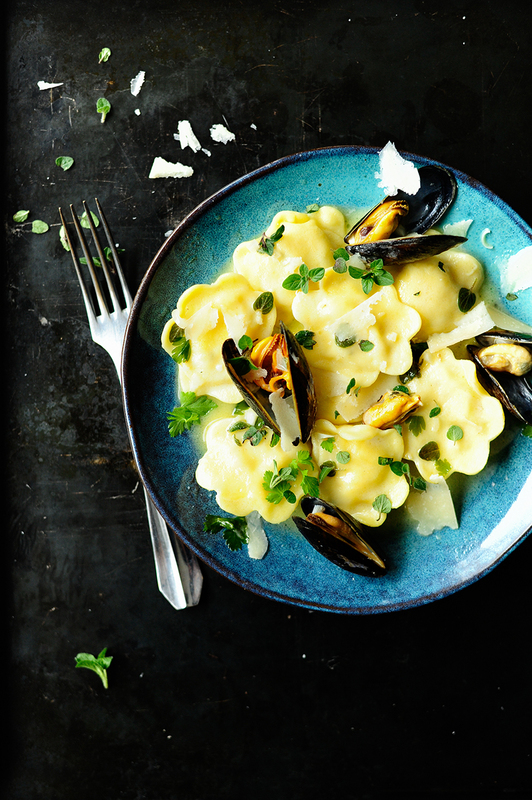 Serve the ravioli immediately with the butter mussel sauce, sprinkle with parmesan. Enjoy!